UPDATED: Thu., Nov. 30, 2017, 7:02 p.m.
NEW YORK – Is Santa Claus coming to town? Wall Street thinks so, even though stocks have already exceeded most expectations this year. December on average is the best month for stocks. 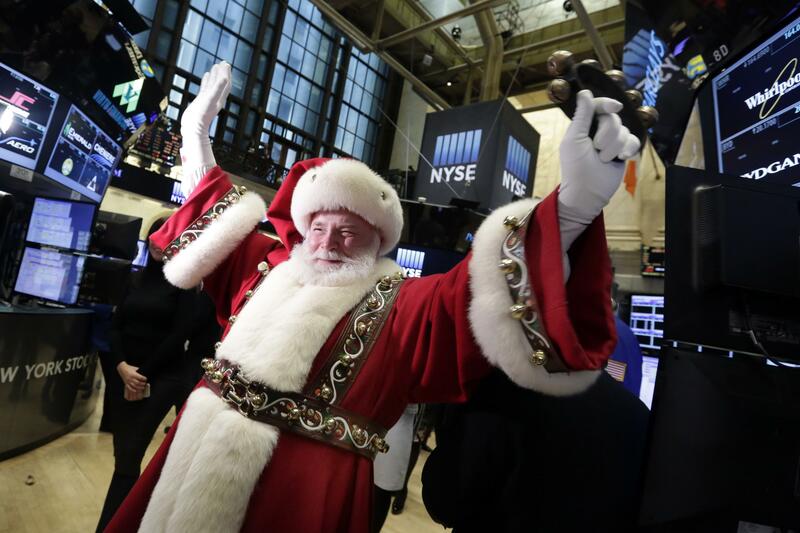 Investors call the gains a Santa Claus rally: a late-year boost that helps the markets end on a high note. Although there are some warning signs and reasons for concern, analysts have some solid reasons to think December 2017 will be pretty good, too. Dating back to 1950, the Standard & Poor’s 500 index has risen an average of 1.6 percent in December. November is second, with an average gain of 1.5 percent. Jack Ablin, chief investment officer for BMO Capital Markets, said investors made a habit of buying at the end of the year to position themselves for January, when stocks typically did well. That set off a cycle. Stocks have climbed as the U.S. economy continued to grow and countries in other regions gained strength, all of which sent corporate profits higher. After strong gains at the end of November the S&P 500 has gained 18 percent so far this year, thanks in large part to big gains for technology companies such as Apple, Google’s parent company Alphabet and Facebook. Meanwhile, central banks are still steadying the markets with bond purchases and low interest rates. The end of those stimulus programs are in sight, but by historic standards bond yields are low, which makes stocks more appealing as investments and borrowing money easier for people and companies. In the U.S., investors are pleased with President Donald Trump’s cuts in regulations and the prospect of lower corporate taxes. It’s also been a historically calm year for the market, with stock indexes hitting records at a steady pace without a lot of big moves up or down. Given all that, conditions seem right for further gains in in December. “Chances are good that we end up with a positive final month of the year,” said Sam Stovall, chief investment strategist at CFRA Equity Research. One concern for investors and experts is that stocks are expensive relative to their earnings. Then again, they’ve felt that way for most of the year and stocks kept going higher. Perhaps the wild card is the tax cut plan, which is still being debated in Congress and could be the coal in investors’ stockings if the measure appears likely to fail. “If the Trump tax cut fails, I think the market goes into a 10 to 15 percent decline,” said Stovall. He said a corporate tax cut would help boost profits and stock prices next year, but without that tax cut, stock prices are too high right now. And as usual, investors will keep a close eye on the Federal Reserve and the U.S. economy: stocks might falter if Wall Street gets the sense that economic growth isn’t strong enough, or a combination of weak growth and rising interest rates might slow the economy. Investors believe the Federal Reserve will raise interest rates at its meeting on Dec. 13. Ablin, of BMO Capital Markets, says some investors might refrain from buying in December and wait until January for tax reasons. But even in a surprisingly good year, there’s reason to think the market will have a solid finish: When the S&P 500 is up 15 percent in the first 11 months of the year, it does better in December than it does in years with smaller gains, according to Ryan Detrick of LPL Financial. Published: Nov. 30, 2017, 1:04 p.m. Updated: Nov. 30, 2017, 7:02 p.m.